Spirit Musings: Vegetarian diet, pork and cancer: According to Master Choa, the modern founder of Pranic Healing and Arhatic Yoga, practitioners of Pranic Healing and Arhatic Yoga must abstain from several types of meat. Namely Pork, Eel and scaleless fish. The reason given is that these animals have dirty energy bodies. Consumption of these types of meat may result in Kundalini Syndrome (走火入魔) for practitioners. It is recommended to eventually go for a vegetarian diet for serious practitioners. Pork in particular is very dirty. It is strange but Islam has long forbidden the consumption of pork with the supposed reason that there are certain "bacteria" in pork that is dangerous to humans if consumed long term. From an energy perspective, if we feel the quality of pork energy, you will find that its quality is similar to that of cancer. And this is what I'm going to write about today. You may notice that if a vegetarian (or vegan) decides to go bak to eating meat, the one meat that they usually have trouble taking again is pork. Beef, mutton, chicken, fish etc can be consumed again after a tough start as you would probably need some getting used to the smell, gross chi etc. 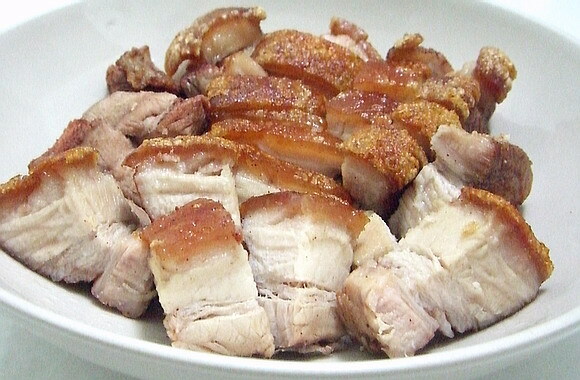 But when it comes to pork, that is the most difficult to re-start. Most former vegetarians/vegans probably would never be-able to re-start with pork again. The reason is because, your energy body is finer when you are a vegan/vegetarian. Meat eaters have grosser energy bodies. Pork eaters who eat a lot of pork has the most gross energy body. So the adjustment from vegan to pork is next to impossible unless the person goes to other meat first for a few years (maybe), then attempt to re-start with pork. However, I must add this. IF you went vegetarian/vegan because of cancer, then my advice is to NEVER EVER consume pork ever again. Because pork energy is similar to cancer, if you went vegan/vegetarian because of cancer, the refine-ness of your energy body that came about from taking only vegetables would not be able to take that plunge into that level of grossness that comes with taking pork. Other meats are fine. You can go back to taking other meats slowly and your body can adjust. But taking pork would cause you to have a relapse faster than you can ever imagine. I've heard and known of cancer patients who went vegan/vegetarian and survived past the number of years their doctors give them, who immediately went into relapse within a year of taking pork again. And the relapse and subsequent deterioration would be swift and unstoppable. Of course, if you have been taking pork all the while, then it is a different story as your body is already used to that energy. So, if you get cured of cancer, taking more pork won't get you a relapse because you are already used to that kind of dirty energy. But chances are, you may be cured but your health may not be as rosy as if you had went vegan. But this is every individual's personal choice after weighing the pros and cons and practicality. My warning however is that, like I stated earlier, IF you went on a vegetarian/vegan diet because of cancer, NEVER EVER consume pork ever again. It will kill you.